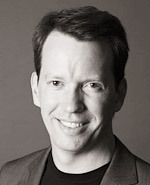 A Senior Research Associate in Physics at the California Institute of Technology, Dr. Sean Carroll’s research ranges over a number of topics in theoretical physics, focusing on cosmology, field theory, particle physics, and gravitation. He is currently studying the nature of dark matter and dark energy, connections between cosmology, quantum gravity, and string theory, and whether the early universe underwent a period of inflationary expansion. He is the author of Spacetime & Geometry: An Introduction to General Relativity, recorded a set of introductory lectures on cosmology for the Teaching Company, and is a contributor to the blog Cosmic Variance. This lecture is on the 2nd part of the Origins & the Big Questions DVD. It is available to order individually, or as part of the full set.